The third dish depicts a design known in Europe as the "red dragon" pattern and was initially copied in Europe by Meissen for the Saxon Court in 1734. 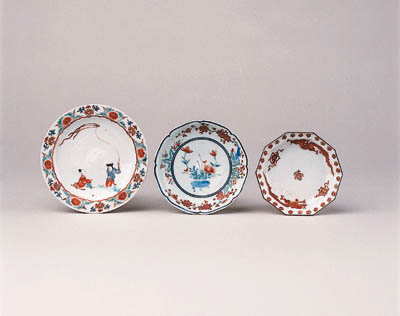 Augustus the Strong had a large collection of Japanese enamelled porcelains including Kakiemon. These were housed by the Elector in the specifically designed Japanese Palace acquired by him in 1717. Many of the pieces were made available to the factory to copy and a group of Meissen wares was made that followed Japanese originals quite closely. Between 1735 and 1740 the Prince de Condé also collected a group of Kakiemon wares and began copying them in the 1760s. These included the "red dragon" pattern which he renamed the Prince Henri pattern. A set of five similar dishes to the first piece are illustrated in Nihon Toji Takiei, vol. 20, Kakiemon, pl. 73.